Open Lecture by Bengt Westerberg: Does better welfare mean higher taxes? You are kindly invited to attend an open lecture by Bengt Westerberg, Chair of the Institute for Future Studies and a politician. In Sweden, to a large degree the welfare state has a universal design. Pre-school, education, health care, elderly care and social insurance is provided for all and paid by taxes. But many want better quality in the welfare sector, which points to higher taxes. This is advocated by some politicians. But others think the high taxes are the problem and reduce growth and productivity. So how should this equation be solved? Bengt Westerberg, Dr Hon, Leader of the Liberal Party 1983-1995, Member of Parliament 1984-1994, Deputy Prime Minister and Minister of Social Affairs 1991-1994. In the capacity as Minister he introduced one of the biggest reforms ever for people with disabilities. Since 1995 he has had a number of commissions, among them as chair of boards of the Swedish Research Council, the University of Linköping, the Institute for Future Studies, the Swedish Red Cross and the Swedish Athletics Association. He has produced reports to the Swedish government on xenophobia and research based on register data. 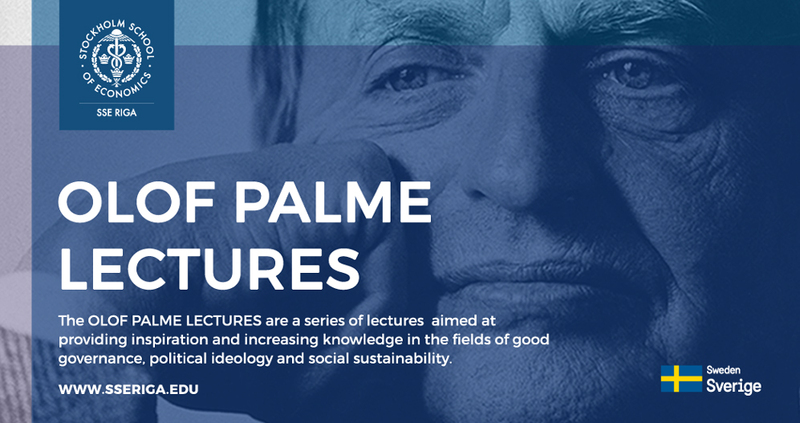 The lecture is offered as part of the Olof Palme Lecture Series that are aimed at providing inspiration and increasing knowledge in the fields of good governan ce, political ideology and social sustainability. Olof Palme served as the Prime Minister of Sweden from 1969-1976 and 1982-1986. His political ambitions were characterised by the desire to reduce inequality and develop the welfare state in Sweden. Olof Palme's mother was born in Latvia and he spent his childhood summers at his grandparents’ farm Skangali in Vidzeme. The Olof Palme Lectures are organised jointly by SSE Riga and the Embassy of Sweden, with support from the Swedish Institute.